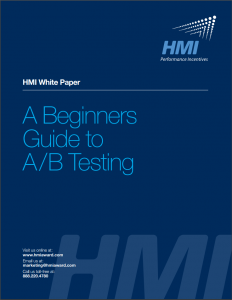 Download the Beginner’s Guide to A/B Testing. A/B Testing is the newest, and perhaps one of the simplest, ways of experimenting with tactics and ensuring results. While this technique is most commonly applied to marketing tactics, it can also be applied quite effectively to other aspects of business, namely incentives. For a look into how you can start implementing A/B testing into your every day business life, download our whitepaper. Additional resource: Check out our A/B testing strategies in action in our case study! Click here.